From bogies to birdies, from aces to cross-court winners, Loews Ventana Canyon is a golf and tennis lover’s paradise. Business travel or leisure travel … there’s always time for your favorite sport. Located just steps from the front lobby and in conjunction with the Ventana Golf & Racquet Club, we offer two Tom Fazio-designed championship 18-hole golf courses. Both courses are designed to blend into the Santa Catalina Mountains’ natural features. Weaving through desert cacti and scenic canyons, the courses embody the character of the Sonoran Desert landscape, as well as a unique variety of desert fauna. The Canyon Course winds through the inspiring beauty of the Esperero Canyon and incorporates the massive rock formation known as Whaleback Rock. Click here for more information about golf at Ventana Golf & Racquet Club. You can also contact the pro shop at 520-577-4015 for tee times or additional information. If you are planning a group or corporate event, ask for the Golf Event Coordinator. Golf club rentals are available for your convenience and the rental includes six golf balls. Enjoy our luxurious accommodations along with a daily round of golf for two. Learn More. Enjoy a daily round of golf for one and then relax at Lakeside Spa with a daily spa credit. Learn More. 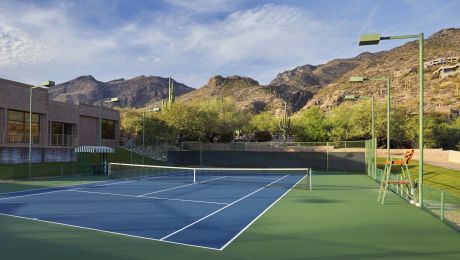 Day or night, invigorate your tennis game on one of our four lighted Tucson tennis courts, surrounded by an inspiring mountain desert-scape. Maybe you’d like to challenge yourself with classes? Or hone your backhand with a friend? Whatever your goal, our staff is available to teach, advise, and also provide rental equipment to our members and resort guests. Don’t forget to look up--there’s no better motivation than the majestic mountains surrounding you. Suitable for all skill levels. This program features singles and doubles play with a professional on hand to discuss strategy and stroke production. Free to members and hotel guests, $10 for locals. Fine tune your tennis skills with a combination of repetitive drills to build muscle memory and consistency, and play-based drills to add creativity and experience to your game. $10 for members, $15 for guests and locals. Special rates apply for members. Click here (Download Acrobat Reader Here) for information on our Membership Programs. 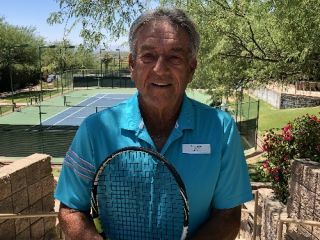 Terry, a certified PTR professional tennis instructor, has been teaching at Loews Ventana Canyon Resort since 2001. An active member of the Babolat Professional Staff and a referenced professional for Babolat Juniors who compete in the Southwest at a national level. Terry has worked with numerous nationally ranked junior players that went on to play for Division 1 colleges (e.g., Georgia Tech, University of North Carolina). Before coming to Loews Hotels, Terry was the assistant men’s and women’s coach at Youngstown University, Youngstown, Ohio (1998-2001). During the same period, he was a tennis professional at the Boardman Tennis Center (Boardman, Ohio) and Liberty Racket Club (Youngstown, Ohio). Terry offers guests private and group lessons from beginner through advanced skill levels. During the months of September-May, Terry supervises organized group play at the resort (Tuesday, Friday, and Saturday), a drop-in, and social-doubles clinic for all levels.